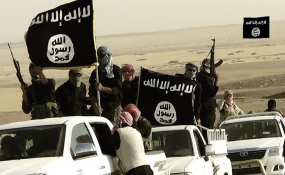 Three Kenyans living in the United States have been arrested by the Federal Bureau of Investigations (FBI) and charged with conspiring to provide material support to the Islamic State in Iraq and Syria (Isis). Federal prosecutors said Muse Abdikadir Muse, Mohamud Abdikadir Muse and Mohamed Salat Haji were arrested in Lansing, Michigan, on Monday. Investigators said Muse Abdikadir Muse had bought an air ticket to Somalia from Grand Rapids, where he was arrested. An affidavit by the investigators said Mohamud and Haji helped him buy the tickets, and also drove him to the airport. "He was checking in for a flight to Mogadishu, Somalia, when he was arrested," FBI said in on Tuesday. It is not yet clear if the Muses are related. According to the FBI, the three recorded videos pledging allegiance to Isis and expressed their desire "to kill non-believers, and even to potentially use a car for a martyrdom operation to run down non-believers in the USA." The suspects came under police watch in April, 2016, when Mohamud Muse posted an item on his Facebook wall suggesting that he supported Isis. Later, an FBI agent disguised as a recruiter contacted him, according to US media reports. The Joint Terrorism Task Force (JTTF) said the three were planning a terrorist attack that would see them use car bombs and ram "non-believers" if they did not make it to Somalia. If convicted, they face up to 20 years in prison under US law. Their arrest came barely a week after the DusitD2 complex attack in Nairobi, in which 21 people died when five terrorists opened fire on people in a hotel, moments after a suicide bomber detonated a bomb near the hotel in the serene Riverside area. Investigations into the attack have revealed that several Kenyans, including a couple, were involved planning and executing the attack. Kenya has been in the front-line in the war on terrorist gangs locally, regionally and internationally, since it is one of the countries that has borne the brunt of terrorist attacks. In its latest report, the Institute for Economics & Peace (IEP) says that Kenya is highly vulnerable to attacks by Al-Shabaab, which is determined to hit back at the county for participating in anti-terrorism operations in Somalia. Since Kenya sent its troops to Somalia in October, 2011, in Operation Linda Nchi, under UN Amisom, to fight Al-Shabaab, the county has experienced an upsurge in attacks. IEP's latest Global Terrorism Index ranks Kenya the 19th most affected country globally, and sixth regionally. "Half of the countries with the largest increases in terrorism are in Africa, with rises also occurring in the Central African Republic, Mali, and Kenya," the IEP said in its 2018 index. Kenya came after Nigeria, Somalia, the Democratic Republic of Congo, South Sudan, the Central African Republic and Cameroon. Isis and Al-Shabaab, with militants in Somalia, have been fighting for territorial control and have clashed in the past as they scramble for fighters and suicide bombers.